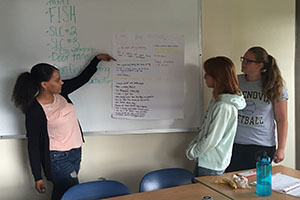 Cazenovia College's unique Project REACH program offers students the opportunity to become mentors to their peers. The Project REACH peer-mentoring program helps first-year students in the Project REACH program transition to college by pairing them with an upper-class student as their peer mentor. These mentors understand firsthand the common struggles of adjusting to college life and the academic demands. "The main goal of this program is to help first year students understand that they are not alone and that their struggles are shared and temporary. All REACH peer mentors go through extensive student development and mentorship training with our Project REACH academic coach and counselor, Kayle Curtin," comments Kailyn VanNorstrand, Project REACH associate director. Project REACH peer mentors have a unique opportunity to support first-year members as they become accustomed to college life during their first semester in the fall. "Project REACH has been there by my side since day one and that is something I have always admired. My peer mentor, Brianna Paddock '15 was by my side freshman year and she was able to help me try new things, meet new people and get out of my comfort zone," adds Ginalucia Triana-Strautmanis, communication studies junior. Project REACH, which has been at Cazenovia College since 1986, provides eligible students with specialized academic assistance, academic advisement, financial literacy counseling, and advocacy. Peer mentors assist new students with the college transition period. They are role models who provide academic, social and emotional support. "Project REACH has supported me by providing me with tutors, workshops, and even with a mentor that became a great friend. I also was emotionally supported by the program staff and they continually advised me on what I struggle with. They are like a new family that adopted me and gave me all the love they had. I could not imagine how my freshman year would have been without them," comments Salat Ali, psychology senior. Management: accounting sophomore, Andromeda Daley adds, "The peer mentoring program has given me the most memorable experiences I have ever had on this campus, and I would do anything to relive those moments again. Being a peer mentor was the best decision I had ever made, and will continue to make for the rest of my days at Cazenovia College." 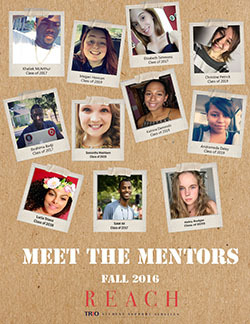 Each peer mentor is assigned a group of eight to 10 new Project REACH students each fall. They coordinate one-on-one and group activities designed to foster support and ease the transition to college. When asked why she became a peer mentor, Elizabeth Simmons, interior design senior said, "I decided to be a mentor because helping people is something that really means a lot to me. As a freshman entering Cazenovia for the first time, I had never been away from home more than one night. I also found it challenging to branch out, make friends, and ask for the help the Project REACH hopes to give. Therefore, I really wanted to be that friend other freshman could come to when they were missing home or did not know where on campus to find proper resources. This position helped me grow into the person I am today - not only was I helping my peers I was also learning how to reach out myself." "I decided to become a peer mentor because I wanted to make a change in someone’s first semester," comments Triana-Strautmanis. "Being a mentee my freshman year and then transitioning to being a peer mentor myself has opened up my mind and heart tremendously. Project REACH is amazing, with an amazing staff, and I could not thank them enough. I would not be the women I am today if I did not have them by my side, cheering my on each step of the way." All students interested in becoming a peer mentor are encouraged to attend an informational session, which takes every year in February. (Although Project REACH members are preferred, all students who have an interest in helping first-year students and who demonstrate a thorough understanding about Project REACH are encouraged to apply.) Applicants are asked to submit an application, resume, and two professional references. Selected candidates are interviewed and decisions are made by the middle of April. When reminiscing about his experience in the program, Ali comments, "I decided to become a Project REACH peer mentor because I wanted to give back to the program and help freshman have a good transition into their first semester of college. The program has made a difference to me and a lot of other students. I learned a lot and it gave me the opportunity to strengthen my skills with people. It is truly amazing how the program creates opportunities for growth for its members." Project REACH peer mentors develop their leadership skills through training and actively mentoring their group of mentees. Peer mentors participate in a Certified Peer Educator Training Program, where various challenges and successes are discussed and additional mentoring techniques are taught during weekly staff meetings. "Becoming a peer mentor was exciting. The whole way through training to meeting my mentees, from getting to know them to celebrating at the end of the semester party," comments Daley. Are you interested in applying to become a Project REACH Peer Mentor for the fall 2017 semester? For more information about the program, please contact Kailyn VanNorstrand, Project REACH associate director at kwvannorstrand@cazenovia.edu or 315-655-7194.